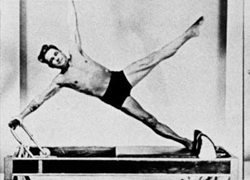 Joseph Pilates was born in a small town near Dusseldorf, Germany in 1883. He was a small and sickly child who was often teased. As he grew older he took it upon himself to become strong and healthy. He was a gymnast, a boxer, and a diver. He observed the movement of animals in nature and devoured anatomy manuals. Before World War I he spent time in England and ended up interned on the Isle of Man upon outbreak of the war. During the worldwide influenza outbreak he and all those interned with him survived and remained healthy thanks to his teaching of his exercise method. It was here that the basis of his method, Contrology, was developed and that Pilates began using springs (removed from beds!) as "extra muscles" to help bed-ridden patients exercise. Pilates returned to Germany after the war and continued developing his method: training the Hamburg police in self-defense and in working with rheumatism patients. Before World War II, Pilates immigrated to the US. On the boat to New York City he met his future wife Clara who was a teacher suffering from arthritis, her work with Pilates during their journey cured her of pain. In New York Pilates opened his "gym". It is there that he further developed his method and with Clara's assistance taught it to those who came to his studio. A relationship between Pilates and the dance community quickly emerged as Pilates rehabilitated injured dancers during a time when physical therapy did not yet exist. Contrology came to be used in dance companies as complementary training and still is today. Pilates is also widely used in physical therapy settings in the US and the UK in particular. Joseph and Clara trained numerous clients who came through their studio, a handful of whom went on to teach the Pilates method themselves. This group of people, known as "The Elders", is credited with spreading the method throughout the world. It is one of these Elders, Romana Kryzanowska who took over the studio upon Clara's death in 1977. Pilates lived a long and healthy life and died at age 84 in 1967 after respiratory complications resulting from his being trapped in a fire in his studio. Our interpretation of physical fitness is the attainment and maintenance of a uniformly developed body with a sound mind fully capable of naturally, easily and satisfactorily performing our many and varied daily tasks with spontaneous zeal and pleasure.